Sonoma, CA- Be forewarned, when you visit Sonoma County, you may never wish to leave. It’s true and yes, Sonoma is spectacular. Sonoma County may not always receive quite the degree of attention as some other California travel hot spots. That’s just fine for adventure seekers who find themselves indulging their wanderlust as they explore Sonoma’s bounty of opportunities and scenic byways that are a bit less traveled. A true California gem with a colorful history, Sonoma County spans some 1,768 square miles encompassing some of America’s finest producing vineyards, miles of dramatic Highway 1 coastline and towering Redwood forests. If that’s not enough, incredible culinary experiences, stunning accommodations with folksy charm and urban sophistication help deliver an incredibly abundant and rich travel experience that few places can match. Good grief, get ready for some fun! Meandering always seems to add another layer of adventure to travels. With Sonoma’s bucolic countryside and charming cities, it’s impossible not to have your interest stirred. Here’s our starting list of things to do and places to go in Sonoma. Fantastic diversions abound! Petaluma, CA– Early morning found us in Petaluma at Sax’s Joint with the local breakfast crowd. Tucked between buildings in a busy, working class neighborhood, Sax’s Joint is an unassuming 50’s home-style diner. Out of control portion sizes, delicious food and a super friendly staff, it’s a great breakfast stop if you’re near Petaluma. Santa Rosa, CA- It’s just one of those places you just know will be cool. Well, you’ll quickly discover, it’s much cooler than you imagined. 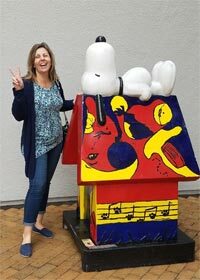 Informative and fun, the Charles M. Schulz Museum in Santa Rosa offers a rotating assortment of displays and events which makes this dynamic museum popular with repeat visitors. Learn about the man behind the iconic Peanuts cartoon strip and the evolution of his beloved characters. Enjoy creative displays, hands-on activities and a replica of the Charles Schulz studio. DON’T MISS: The gift shop next to the hockey rink just across the street. Guerneville, CA- After saying goodbye to Woodstock, Snoopy and the Peanuts gang, find your way over to Highway 116 West as it weaves its way along the famed Russian River. 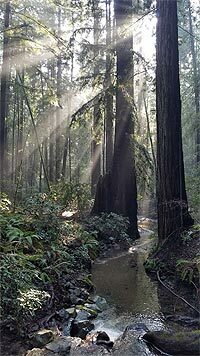 Just north of Rio Nido, the mighty trees of Armstrong Redwoods SNR await. Flat, level and accessible trails provide easy access to these long standing sentinels of the forest. Watch and listen as gently flowing waters wind their way through this canopy darkened forest with occasional rays of sunshine penetrating the mystery to light the way. Enjoy a serene and humbling experience as you walk among the ancient giants. TIP: FREE, when you park in the lot just outside the booth and stroll in at no cost. Small communities dot the landscape and for a quick diversion check out Duncans Mills (population ~100). 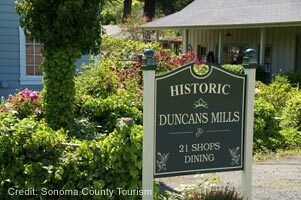 A 19th century sawmill community turned modern stop, Duncans Mills features a small collection of adorable shops and eateries in one of the most unlikely of spots. A enjoyable place to shop for souvenirs or grab a coffee and a bite, the Gold Coast Bakery serves up some incredibly tasty pastries and hot coffee. When your busy day full of exploration draws to a close, restore yourself in comfort and luxury. 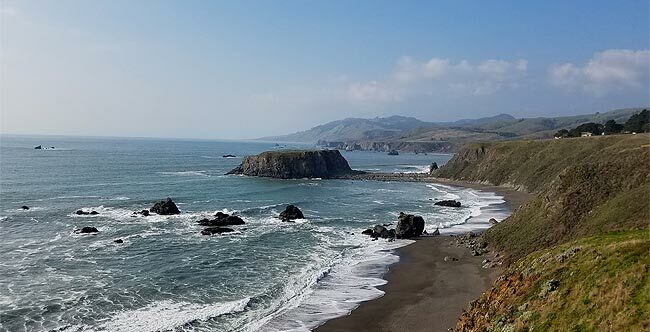 An upscale destination with the warmth of home, Bodega Bay Lodge is a fantastic vacation getaway for a little pampering, scrumptious food and a drink while absorbing the grandeur of Somona’s Coast. 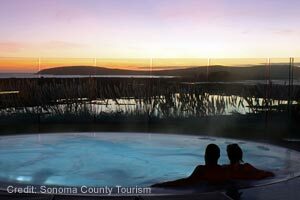 Consider arriving in time to catch one of California’s magical sunsets from either the comfort of your room or from a table at the property’s restaurant, Drake’s Sonoma Coast. Serving up exquisitely prepared and locally infused seasonal dishes, it’s the perfect spot to recap your day’s adventures over a seaside dinner. Complete your experience with one of the staff selected Sonoma wine pairings, and maybe some dessert. Great bets: Seafood entrees and New England Clam Chowder. After Happy Hour, stroll over to Drake’s Sonoma Coast for dinner. Mingle and relax each evening as the Bodega Bay Lodge hosts happy hour for guests. Sit by the fire, converse or play a game while sampling locally exclusive wines, cheeses, fruits. Happy hour is a great time to meet and chat with fellow travelers. All stylishly decorated and well-appointed, the Bodega Bay Lodge offers several plush and intimate accommodations. From the intelligent layout of the property, it appears all rooms include stellar views! We enjoyed our stay at the Ocean Club Whirlpool Suite, which is considered the crème de la crème of this property. If available during your planning, strongly consider grabbing it! A nautically-themed suite with a large open great room format allows you to soak in ocean views from every vantage point. On those chilly evenings and mornings, unwind as your watch the glow of the fireplace from the comfort and warmth of your bed. Perfect for that romantic getaway! Rain or shine, there’s virtually no such thing as bad weather when visiting. On sunny days, relax on your porch, take a dip in the pool or stroll the area while soaking in some vitamin D. On those rainy or overcast days, stoke the fire in the living room area, order up room service and bottle of wine to enjoy! TIP 1: On rainy days, brave a short walk to the infinity hot tub and settle in for an incredible experience. TIP 2: Grab the binoculars and enjoy the often frenetic pace of the avian community that touches down here. A heated pool and large infinity hot tub are open year round. With a perfectly heated hot tub just a few steps from the suite, throw on your hotel robe and splash down for a relaxing soak with amazing views. When you’re finished, grab a seat next to the gas fire pit to warm up before heading back to your room. 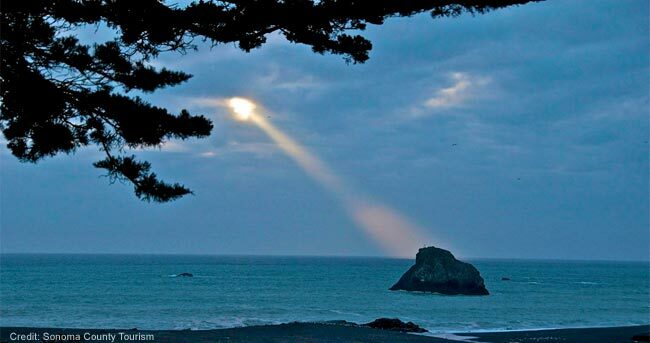 Begin and explore your own extraordinary experience at Bodega Bay Lodge. Discover Sonoma and experience how Life Opens Up for those that take a little extra time to uncover the gems that provide a richer travel experience.